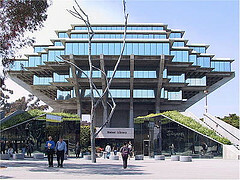 Named in honor of Audrey and Theodor Seuss Geisel, the Geisel Library building is a UC San Diego landmark. Library visitors are asked to respect the needs of the campus community by minimizing interference, not blocking traffic, and keeping visits short. Tour groups are restricted to the 1st and 2nd Floors of the building. Floors 4 – 7 are designated for quiet study, and Floor 8 is for silent study. For groups of individuals under age 18, one chaperone must be present for every fifteen students/children and must stay with the group at all times. Staffing does not accommodate tours on weekends. A minimum of 3 days advance notice is required. No tours (scheduled or walk-in) are permitted during weeks 9, 10, and Finals Week of each quarter during the academic year. See visitor parking information and maps and directions. Tours for UC San Diego student audiences can be scheduled on selected weekdays and times each month (see request form for registration). These tours showcase the wide variety of study spaces, library collections, technologies, equipment, and amenities offered within Geisel Library, in addition to offering an introduction to the many services its staff provide. Services and spaces offered in the nearby Biomedical Library Building are also mentioned. Tours are limited to a maximum of 25 people. We may not be able to accommodate tour groups larger than 25. Tours are approximately 45 - 60 minutes. Tours for Spring, 2019: Visit the Register for a Geisel Library Tour page for Spring Quarter tour dates. Tours for non-UC San Diego audiences can be scheduled on selected weekdays and times each month (see request form for registration). These tours showcase the artwork and architecture of Geisel Library, and offer an introduction to the history of the Geisel Library and selected services its staff provide. Tours are approximately 30 - 45 minutes. Academic-focused tours for school groups may be available for grades 8 - 12, but are subject to staff availability. We cannot accommodate groups larger than 25 on any single day. These 45-60 minute tours are intended to inspire students to attend college or to understand the university environment and experience. They focus more on the role of the library in the academic life of students than on the library’s art and architecture. Tours conducted by subject librarians can be available during the week for UC San Diego classes, departments, and Visiting Scholars. UC San Diego faculty or staff may contact the appropriate librarian directly to arrange such a tour. Tours of the Biomedical Library Building (BLB) may be available for scholars with research interests related to health sciences. Contact the appropriate librarian directly or Serafin Raya for details and arrangements (alternately, Michelle Vogelsang Jones if Serafin is not available). Excluding the first week of the fall quarter and the last two weeks of each quarter during the academic year (see the campus calendar for details), Geisel Library is open for self-guided tours, and visitors are welcome to explore the building’s 1st and 2nd Floors. Floors 4 - 8 are designated for quiet study and are not open to the public. Stop at the Information Desk for a printed copy of our self-guided tour brochure (or download an electronic version of the self-guided tour brochure). You can also direct any questions to staff at the Information Desk. Discover the history, art, and architecture of the UC San Diego campus — from world-famous buildings to historic eucalyptus groves and renowned public artwork. Free walking, bus, and green building tours are held year-round by the UC San Diego Visitors Tour Program and showcase the most notable features of the 1,200 acre campus.